I’m quite sure I’ve talked about how the worst part of cooking is the clean up. 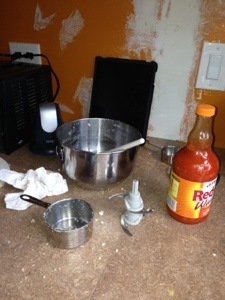 Nothing has changed on this front but because I made the mess I might as well get some mileage out of the disaster area of a kitchen – I made 4 pizza crusts for me (1 complete pizza with details below) and 2 mini pizza crusts for Abbey. The cauliflower pizza crusts is FINALLY perfected and my new topping of buffalo chicken has made this my new favorite pizza of all time. 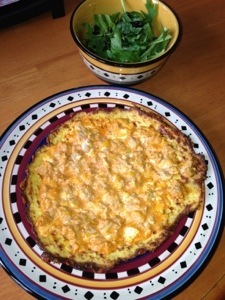 I got the recipe from Sandy’s Kitchen where she calls it Cauliflower Buffalo Chicken Pizza. It is almost a complete Lean and Green meal, you are shy one green which I decided to do as a side salad to my pizza. The bad news was that you are out of condiments at this point so the side salad was dry. Sandy suggests that you add 1/2 cup lettuce and 1/4 cup chopped tomatoes (1 green) to your pizza and you can even fold in half as a pita. This time around I had Abbey try the crust and she loved it, I can’t wait to make her a pizza from the two little crusts I made for her. As a final FYI, I am freezing the left over crusts. I pack them in a freezer ziplock bag with the parch paper in between each crust. I don’t too them until I’m ready to bake. These crusts do freeze well and taste just as delicious once thawed and baked for a quick meal. I have now made this recipe twice; once the morning before running the Cincinnati Flying Pig half marathon and now once to bring into the office to share as my birthday brunch treat. 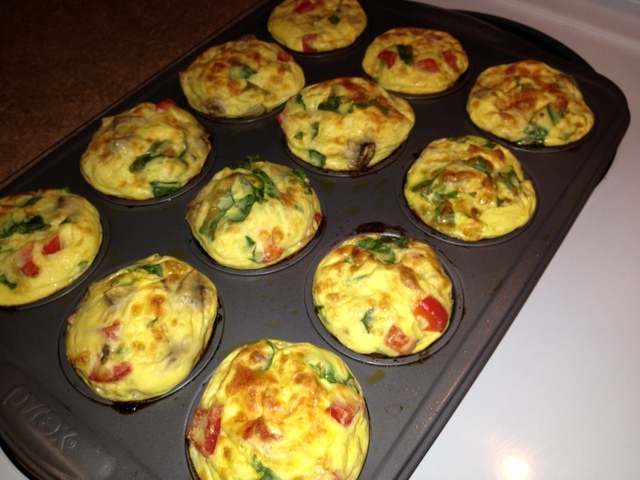 After posting pics of these beautiful and delicious egg muffins I received an overwhelming request to share the recipe. Side note, I have decided to become a health coach and this recipe is “lean and green” friendly for the optimal health program that has helped me lose almost 30 pounds in just two and a half months. Here we go! Preheat oven to 350 degrees. Dice mushrooms, spinach leaves and red peppers. Mix Eggbeaters, cheese, all veggies (feel free to add more). 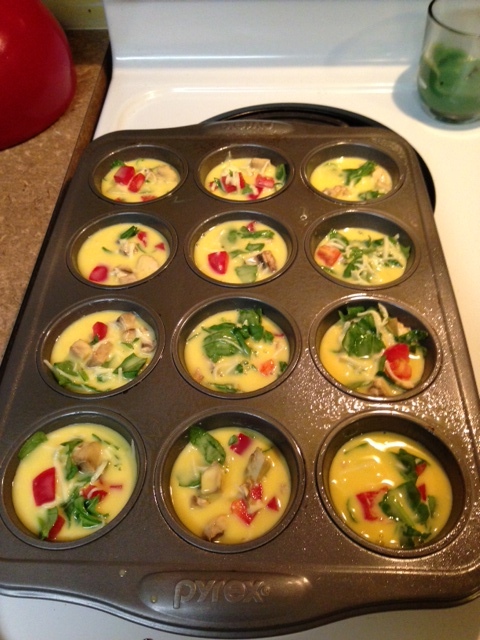 Spray muffin tin with butter/oil then fill each muffin cup evenly with egg, cheese and veggie – I used a 1/2 cup measuring cup to evenly fill. Each cup should be about 3/4 full. Bake at 350 degrees for about 25 minutes. When the muffins are done, loosen them with a knife before taking them out of the muffin pan. Remove from muffin pan and let cool for about 20 minutes on wire rake before transferring into the refrigerator or freezer. Muffins will keep in the refrigerator for about a week within freezing. Egg muffins can be frozen and reheated. For best results, thaw in the refrigerator before reheating. Microwave on high about 2 minutes to reheat 2 muffins. I’ve never had a muffin right out of the oven but instead I have put in the fridge and reheated the next day and it tasted yummo! Perfect for a baby shower, bridal shower or even great for a quick breakfast throughout the busy work week. This full recipe is 2 lean servings and 3 green servings. You can enjoy 6 muffins in 1 day for 1 full lean and 1.5 green serving (great to eat with a salad at brunch for the extra greens). Just remember to incorporate 1,5 more green servings and 2 Healthy Fat servings to complete your Lean and Green for the day. 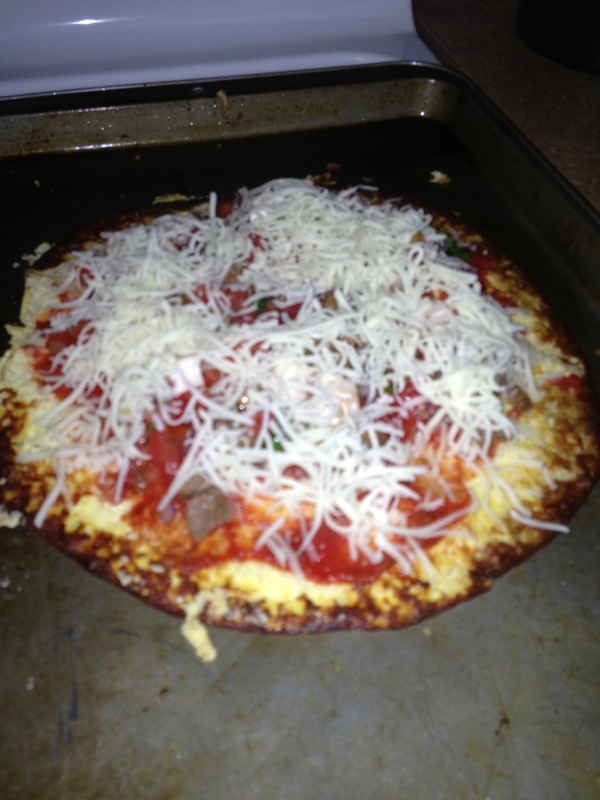 I was able to make a pizza, eat the ENTIRE thing and still feel great about myself and the food choices that I made. 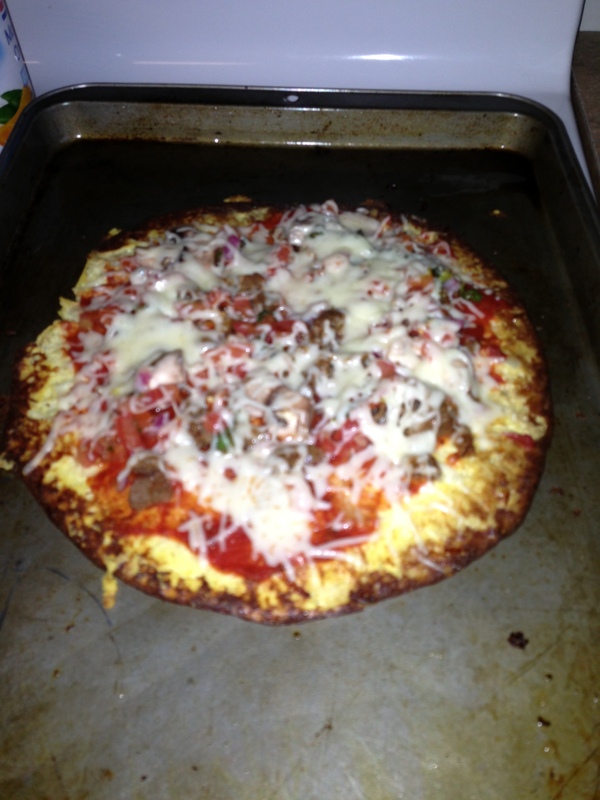 I made a pizza with cauliflower crust. 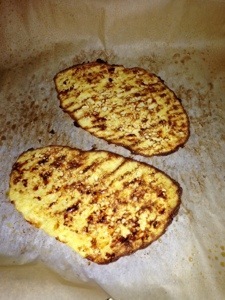 Wait, don’t click out of my blog post just yet, it was tasty! I used an entire head of cauliflower – this actually yielded two individual pizzas (yes that is a frog bib, do you expect anything else from me?). Don’t forget to pre-heat your oven at 450 degrees! 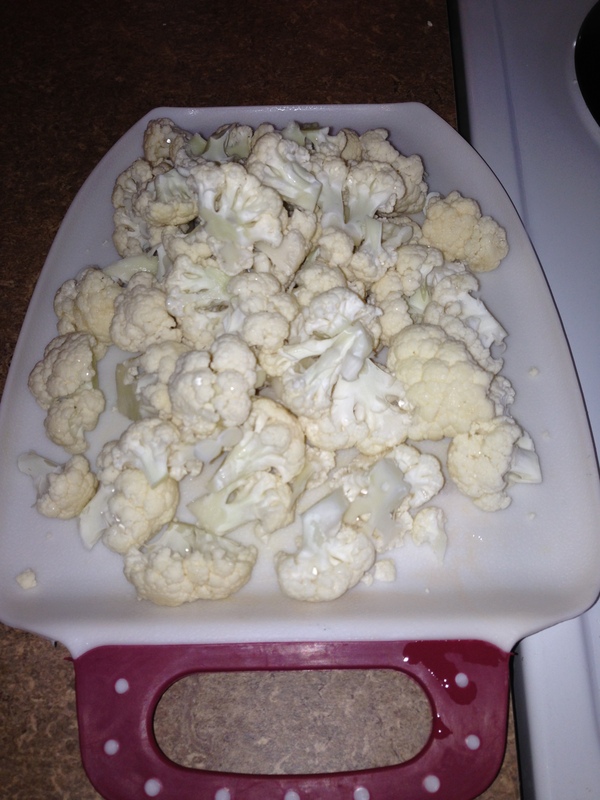 After washing, break all the cauliflower up into smaller pieces. 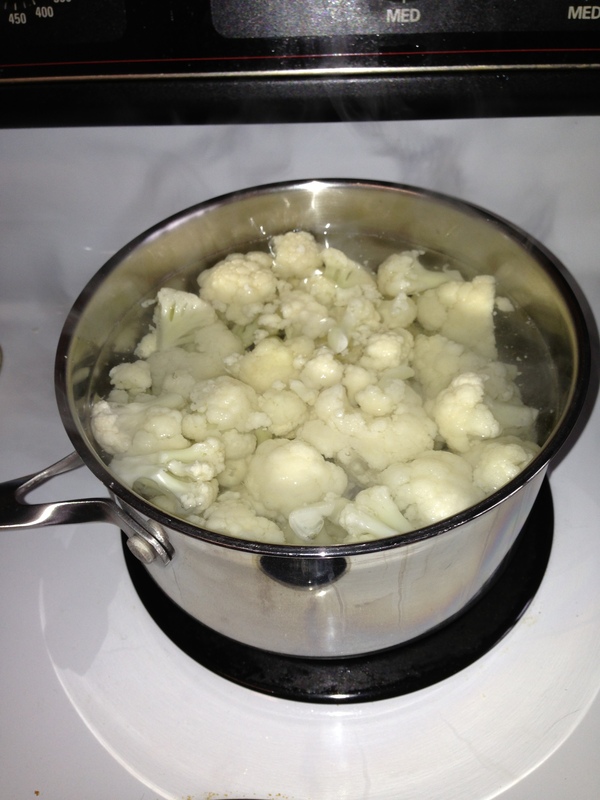 Go ahead and fill a pot with water, and once boiling, dump your cauliflower pieces in for about 6-8 minutes. Once your pieces have boiled long enough, drain (but keep hot) and pat moisture with paper towel. 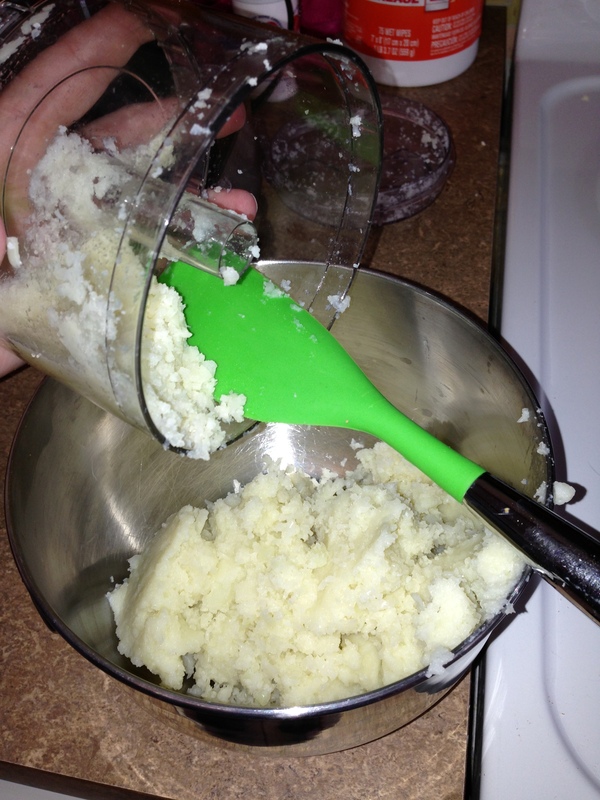 Add to food processor or mash with spoon so that you have a “mashed potato” consistency. 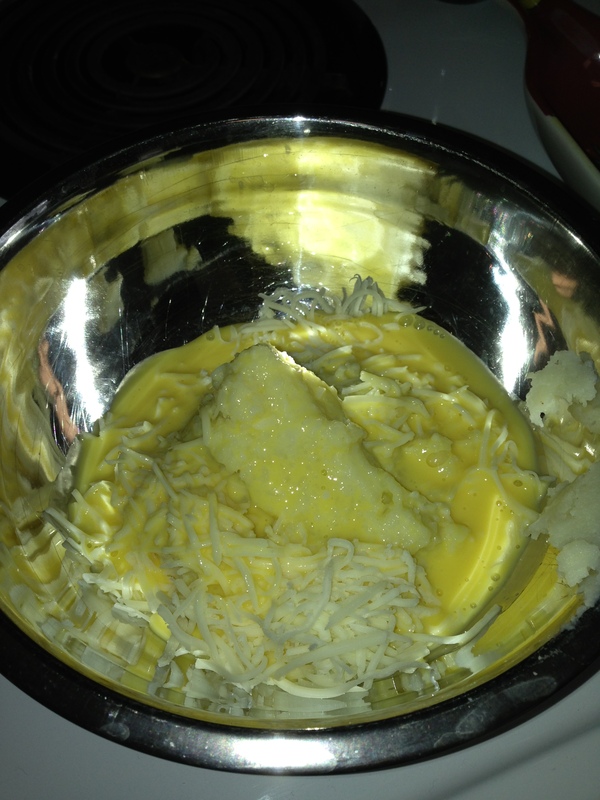 Measure out 1 cup of the mashed cauliflower, add 1/4 cup egg beaters and 1/4 cup low fat cheese (I used mozzarella but heard that Three Cheese Blend has less moisture and will help with the crust not being as mushy). This entire bowl (above) creates ONE individual pizza crust. Once you have mixed your crust you’ll want to spray a crazy amount of Pam on a cookie baking sheet or parchment paper/wax paper would probably work okay too. 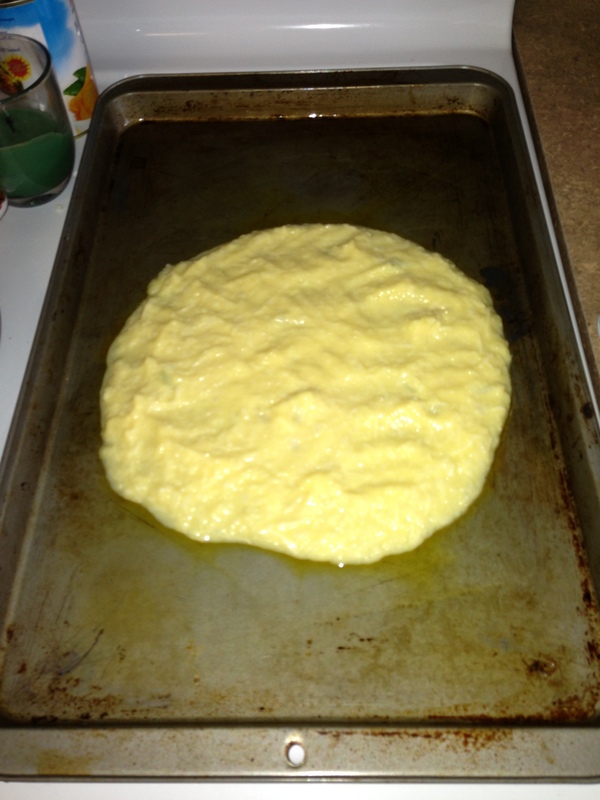 Go ahead and pour mixture onto the baking sheet in a circular shape. I used my rubber spatula to shape and pat down so it wasn’t too thick. I’ve heard others use a springform pan but I think that just adds to the clean up which is the WORST part of cooking IMO. Bake for at least 15 minutes, I would even recommend 20 to make sure the middle isn’t mushy. 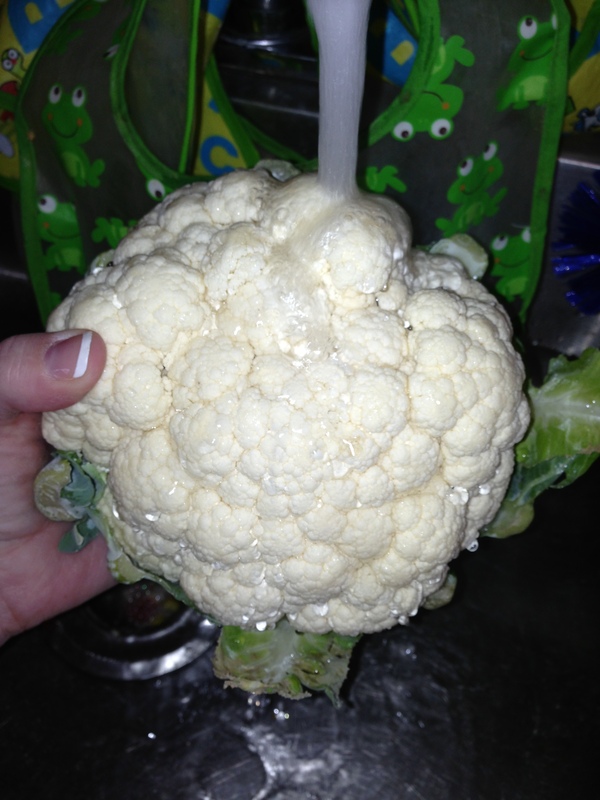 Again, one head of cauliflower will yield 2 individual pizza crusts. You’ll know your crust is close to done when the edges start to brown and look crispy. Again, I put mine in for 15 minutes and should have gone more like 20 minutes. 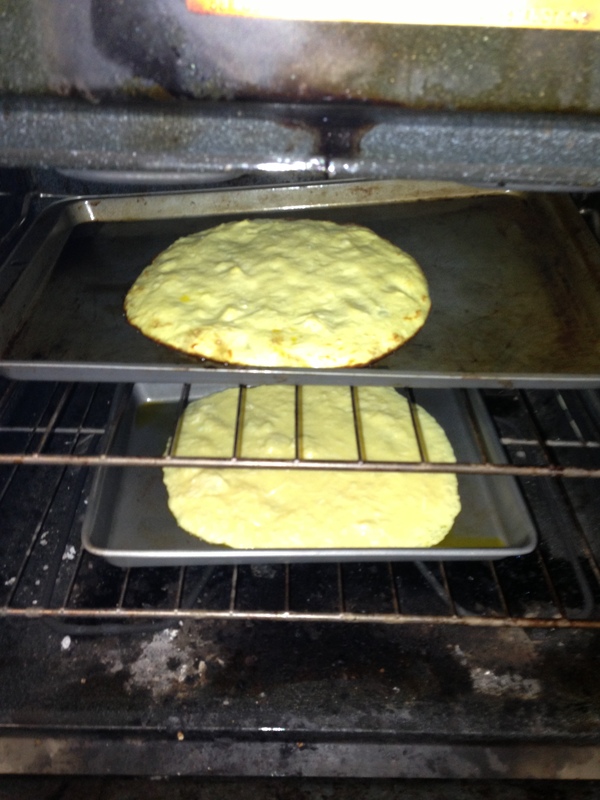 Go ahead and put the pizza back into the oven at 350 degrees for about 5 or so minutes to let the cheese melt. 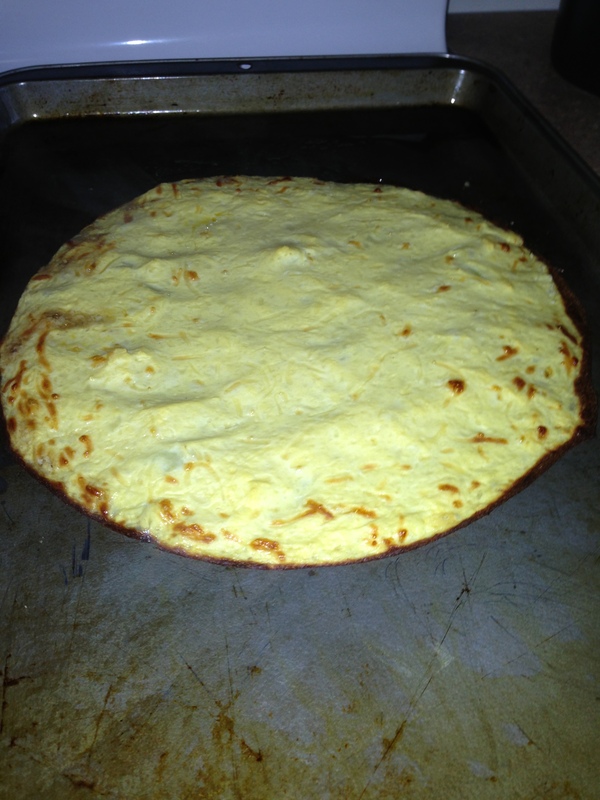 And once the cheese is melted you’ll have a delicious individual pizza to enjoy! 1 Complete Lean and Green Meal, 3/4 Condiment (Not even 1 Condiment! ), with no Healthy Fat required. I honestly almost couldn’t finish this pizza because it was so filling.